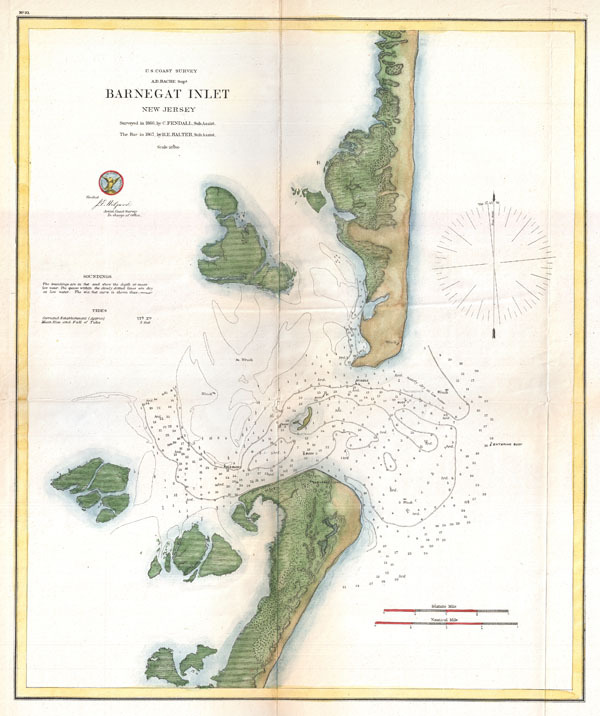 This is the U.S. Coast Survey's attractive 1865 map or chart of Barnegat Inlet, New Jersey. Barnegat Inlet is the opening between the New Jersey barrier Islands of Long Beach Island and Island Beach State Park. Historically this important inlet allowed trade ships access to important Barnegat Bay ports such as Toms River. The map offers excellent detail both inland and at sea. Identifies Barnegat Lighthouse, which still stands, as well as numerous ship wreck sites, buoys, and depth soundings. This chart was surveyed by C. Fendall and R. E. Halter. Produced in 1865 under the Supervision of A. D. Bache, the most dynamic and influential leaders of the U. S. Coast Survey. Updated to 1867. Very good condition. Minor toning along original fold lines.